I don’t even know where to start, I think I might have fallen off the face of the earth…does anyone else ever feel like a hamster on a wheel? So yeah, lots going on, not much to show for it just now, but hopefully next week I can get my mo-jo moving again. In the meantime, here’s a sneak of a project I’m currently frantically pulling together, as my deadline is looming! I hope everyone had a beautiful, relaxing, grateful day of Thanksgiving. I know I did. I can’t WAIT to see the new project!!!! 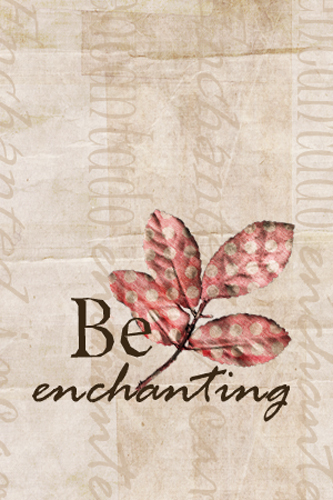 I love that sentiment–be enchanting, indeed! It somehow seems especially resonant during the holiday season (or maybe it’s just that it’s winter). Can’t wait to see what’s next!